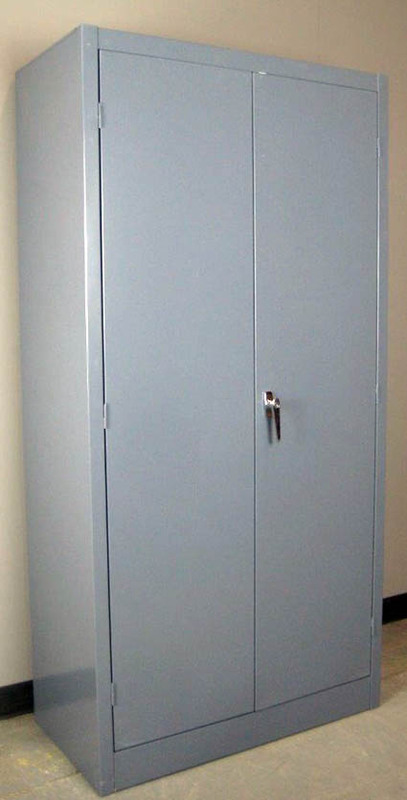 These Metal Storage Cabinets are available on www.buyusedlockers.com where they have a huge selection to choose from if we need additional supplies. Dimensions: 36" x 18-24" x 78"
We have brand new metal storage cabinets in stock available for immediate shipment nationwide. 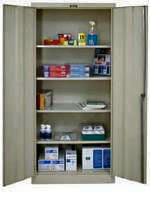 Each Metal Storage Cabinet includes four shelves that are adjustable on 2" centers. Each shelf is rated for an evenly distributed load of up to 110 lbs. per shelf to store large and heavy tools and equipment or any products that you deem valuable to the operations of your business. These have convenient double doors that open wide and allow full access to each shelf and your stored contents. Each cabinet comes equipped with locking turn handles and includes 2 keys per lock. These storage cabinets are available in 18" or 24" deep. 24" deep model holds more than 36 cubic feet of material. Ready for immediate shipment in Beige or Gray colors. These are industrial grade and built sturdy and solid to withstand the rigors of daily use.